Your family has toured communities, spent lunches at assisted living options, met multiple residents and staff, and now you have made your final selection on a new assisted living community for your mom. But are you sure that she is going to like it? Are you worried that she will adapt? It’s key to prepare for a move into an assisted living community, so your mom will quickly learn to enjoy her new home. Having worked with thousands of residents and their family members over the past 21 years, we have some suggestions for starting off on the right foot, so she likes her new home. We understand that making a new friend or two can positively impact your mother’s attitude toward her new home. Our staff is skilled at introducing new residents to like-minded friends and neighbors. They encourage new residents to participate in activities and go on the local excursions. Our staff will ensure that your mom is not sitting alone at a meal. We take great effort to make her comfortable in her new home during the transition. Encourage your mom to not stay in her apartment. The entire community is her home that she is welcome to spend time enjoying. Help her set up a morning routine of breakfast followed by coffee in the bistro to meet other residents. Once she is up, dressed, and out of her apartment, she will be more apt to participate in activities and interact with others. Encourage her to learn her way around all the different rooms and to explore the various areas within the community to see what they have to offer—lounging by the fireplace in the living room, participating in a balance class in the fitness room, learning to paint in the craft room, or enjoying a cup of tea in the library. Our Life Enrichment Directors work hard to create a rotating calendar of engaging events, activities, and special interest groups to encourage social interaction among our residents. They are keen to develop programs that spark the imagination or passions of our residents. Our Life Enrichment Directors love to learn about the interests of our residents and build programs that they will enjoy. Share your mom’s hobbies, interests, and passions with the Life Enrichment staff. They can suggest or cater programs to her interests. Make new friends at meals. Meals are a wonderful time of the day to meet neighbors and create new friendships. Encourage your mom to eat her three meals each day in the dining room. Even if she is not that hungry, she can get something small. It is an excellent opportunity to eat at different tables and introduce herself to other residents and staff. If she is shy, any staff member will help find her an open table and introduce her to those sitting with her. 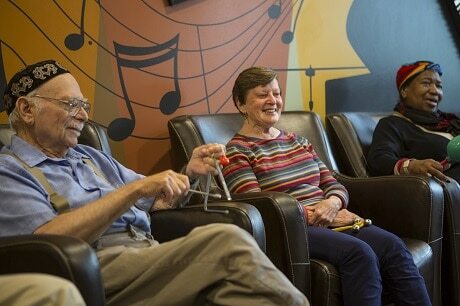 Many friendships have been made over a lingering cup of coffee after a good meal at Aegis Living. Invite friends and family to enjoy the community. We take great pride in creating communities that are comfortable, welcoming, and beautiful. We want our residents to share their home with friends and family members. Whether they are sitting by the fire in the living room, walking in the landscaped garden, or enjoying a cocktail in the lounge, your mom will feel at home when she is surrounded by those she loves. Our communities also provide private dining rooms that can be reserved for special occasions or family events. This is a great way to make your mom feel at home when hosting a birthday or celebration as she would have done in her previous house. Hosting an event can help her feel more ownership in her new home and a sense of independence. Plan to visit on a regular basis and feel free to explore the various spots throughout the community to share quality time together. Studies have shown that family contact is one of the strongest predictors of satisfaction and happiness. Family involvement has been linked to lower mortality, less hospitalization, and earlier hospital discharge in a study of those living in long-term care. Be proactive and ask for help. Your mom’s happiness is important to us. We will make every effort to help her adjust. If you are concerned that your mom is not adapting well, contact the General Manager to see if they are things that can be done to make her more comfortable. The chef can prepare a family recipe to comfort her, the Life Enrichment Director can add her favorite pastime to the activity calendar, or we can play her favorite movie in the theater. These little treats can make a significant impact on her happiness and comfort as she settles into her new home. Make sure there are no health issues. Our Health Services Director monitors the health, both physically and mentally, of our residents closely. If your mom is not adjusting well to her move, then they will make sure there are no issues of depression or underlying health concerns that might cause discomfort or pain. No one will react positively to a new living situation if they do not feel well. At Aegis Living, we make sure that staff pay extra close attention to new residents and their health is monitored and treated appropriately. Aegis Living has so many opportunities for your mom to interact with her neighbors, meet new friends, learn new hobbies, stay active, and mentally engage in activities. We will try to make her transition as smooth as possible. With family encouragement, support, and a little time, she will ease into her new home successfully.